Unlike other online editors we have made an effort to make it possible to use big photos within goDromo’s. Most online editors will usually limit you at around 16 megapixels. That’s an screenshot of the editor with a 8192×5100 photo open for editing. That’s a wooping 42 megapixels. If you look at the navigator you can see that this photo is really big. 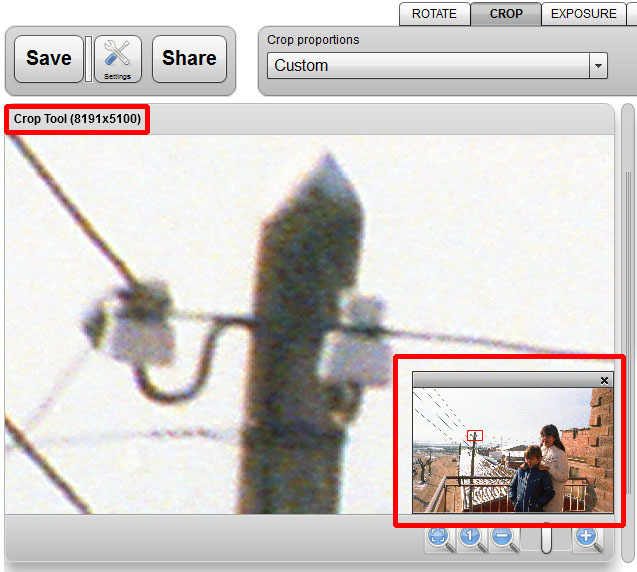 We have zoomed in all the way and we can even see the film grain of the original photo. This photo was digitally scanned from an old film. Recent devices, cameras, cell phones, tablets, are generating ever bigger photos. Having a 64 megapixel limit makes goDromo Photo Editor future proof. You can edit and save big photos. No reason to compromise. You don’t have to make your photos smaller before using the online editor. This would be a hassle. Your ability to open big photos will greatly depend on your computing device. If you don’t have enough memory or your device is slow you may notice slowdowns. We have written the editor so most computers can handle these big pictures without problems but we recommend to at least have 2GB of memory and a fast computer/tablet. While you can open as many editor browser windows as you wish, if you are using big photos you may experience problems if you are using them simultaneously.